Finding healthy and nutritious snacks for kids can be a stressful task.Every mom has spent time researching and creating tasty kids snacks, only to have them left uneaten. Here at Meraki Mother, we have found two sure-fire ways to get kids to eat anything. Firstly, make food bright, fun and colorful. Secondly, get kids in the kitchen. It is amazing how quickly they will eat something they have helped to create. 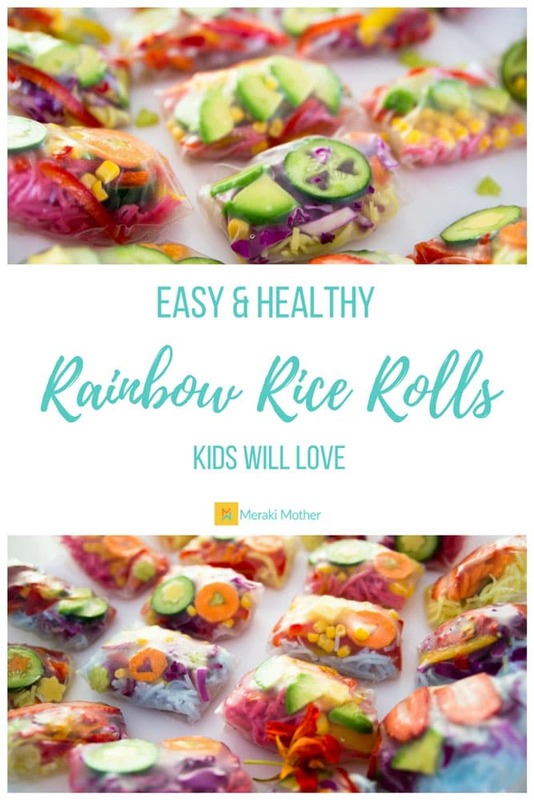 We have found the perfect kid-friendly snack which covers both these, our fun Easy and Healthy Rainbow Rice Rolls. 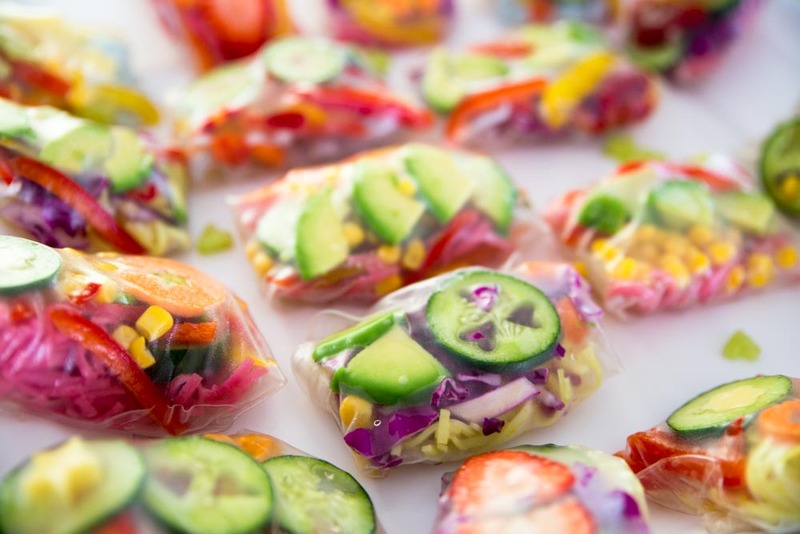 We are pretty sure the grown-ups will love these fun, healthy rice paper rolls too. With beautiful fresh fruit and vegetables packed into them, these are a super healthy rice paper rolls recipe. We all want to give our children the most nutritious and healthy food possible, and this is such a fun way to do it. Want more information on healthy eating for children? Head to our Guide to Healthy Eating for Kids. It’s easy and fast. If you haven’t used them before, you may be surprised at just how easy rice paper rolls are! They can be eaten by nearly everyone. A question you may ask for children who suffer food allergies. Are rice paper rolls gluten-free? Firstly, is rice paper gluten free? The answer is tricky as some brands of rice paper is gluten-free. So be sure to check package labels carefully that they do not contain wheat flour. Secondly, we used glass noodles for this recipe which are completely gluten-free. But again, please check all packaging carefully. Dye if you want to color your noodles. You can use a few drops of food coloring for brighter colors but we used natural colors. Beetroot for pinks, tumericor saffron to get yellows, spirulina for green etc. Your kids favorite fruit and vegetables. 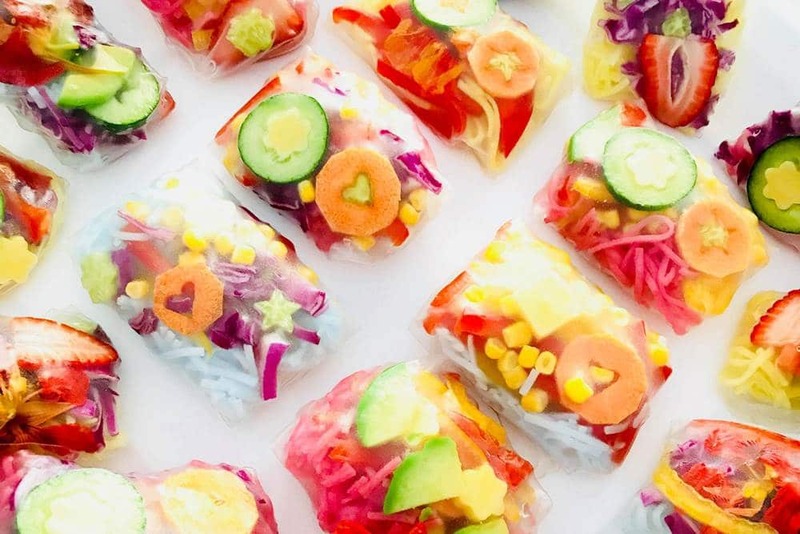 Some rice paper rolls filling ideas are – Avocado, Strawberries, corn, carrots, cucumber, herbs, peppers and red cabbage. If you want to add dairy you can also use a hard cheese like cheddar. Cook your noodles as per the packets instructions. If you choose to dye your noodles, next separate into individual bowls for each color and dye. Allow to cool. Prepare your rice paper rolls ingredients. You can really get the kids involved with this part. We used a spiralizer and metal cookie cutters to create beautiful shapes and textures. Get your rice paper ready. It is easy to learn how to cook rice paper, simply fill a shallow dish ( that is wide enough to hold a sheet of rice paper ) with tepid water. Place the wrappers in the rice paper water bowl and let soak for 5-20 seconds until they are soft and a little tacky to the touch. They will still be absorbing the water once removed so make sure you only do one at a time so they don’t stick together and do not leave them for too long or they will be too difficult to work with. You will need to individually soften rice paper as you are going to create your spring rolls. Create the best rice paper rolls in town. It is easy to learn how to roll rice paper rolls. Place your softened rice paper onto a surface. How to keep spring rolls from sticking? Try to avoid wooden surfaces and try a ceramic plate or plastic cutting board. You could also try some lightly oiled baking paper. Layer your ingredients in the center of the rice paper wrapper and fold in the sides and edges to create a parcel. Place the ingredients you want to be seen through the paper on the bottom layer and finish with the rice noodles. Be sure not to over-stuff or the rice paper will split. We didn’t roll our rice paper wrappers as it was just too tricky for the children to do. This is part of the fun when cooking with kids. Teach them it’s okay to make mistakes and learn…plus they get to eat all the rice paper that tears. This vegetarian rice paper rolls recipe tastes amazing but you can always decide to add meat with some shaved ham or spice it up with peanut sauce for rice paper rolls. You could also leave out the noodles and fill your rice paper wrappers with extra vegetables and fruit too. These delicious snacks are best served and eaten fresh. If you do have leftovers though it is easy to learn how to keep rice paper rolls fresh. Although they will have a slightly different texture from fresh made, the best way to keep rice paper rolls for up to two days is by wrapping each rice paper roll up individually with plastic wrap, then placing them in an airtight container and popping them in the fridge. Don’t eat them straight from the fridge though, leave them to stand at room temperature for about half an hour before finishing them off. Be sure to pin this delicious recipe for later. Looking for more rainbow inspo? Try our healthy Rainbow Toast or our gorgeous Rainbow Party post.